Karl Malone is widely considered one of the best power forwards in NBA history and one of the top players without an NBA title. 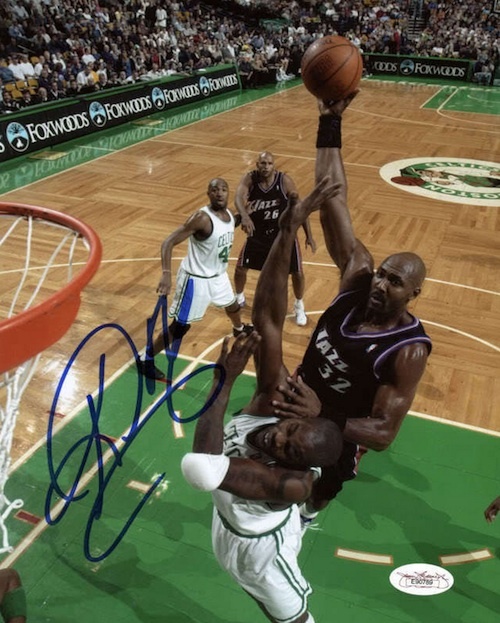 Although the lack of titles has hurt his collecting value, Karl Malone cards and autographs remain popular with collectors. Shop for Karl Malone Cards on eBay. Known as "The Mailman," because he always delivered, Karl Malone spent his college years at Louisiana Tech. 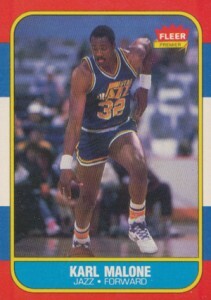 His play there put him on the NBA radar and Malone was selected 13th overall by the Utah Jazz in the 1985 NBA Draft. Malone would spend nearly his entire career with the Jazz and paired with John Stockton to form one of the best combos in the league. Although the team was always in playoff contention, including 19 consecutive playoff appearances for Malone, he could never claim the elusive NBA championship. Still hoping to obtain a title before he retired, Karl Malone joined Gary Payton on the Los Angeles Lakers in 2003, alongside Kobe Bryant and Shaquille O'Neal. The team lost in the finals and Malone eventually retired. Karl Malone left the game a 14-time All-Star, two-time regular season MVP, two-time All-Star MVP, and with the second most total points in NBA history. He also helped Team USA bring home gold medals in the 1992 and 1996 Summer Olympics. Karl Malone was named as a member of the 50th Anniversary All-Time Team and was inducted into the Pro Basketball Hall of Fame in 2010. Although he was a an elite player for much of his career, "The Mailman" did not have a lot of modern autographed cards until recently. After a sizable hiatus, Malone signed for a variety of 2012-13 products from Upper Deck, Panini and Leaf. His autographed memorabilia is not in as great of supply, but he has signed more since he was inducted into the HOF. While Michael Jordan will always be the top draw from 1986-87 Fleer, Malone is arguably one of the best options after MJ. The design has now entered collecting lore based on the relevance of the checklist and increased interest in basketball cards. One questionable aspect of the Karl Malone rookie card is the image. The photo utilized shows Malone quickly dribbling down the court, but his eyes are fixed on the ball, which is barely visible. The end result is something that resembles Malone reaching for the ball, while tripping, and throwing out his back in the process. 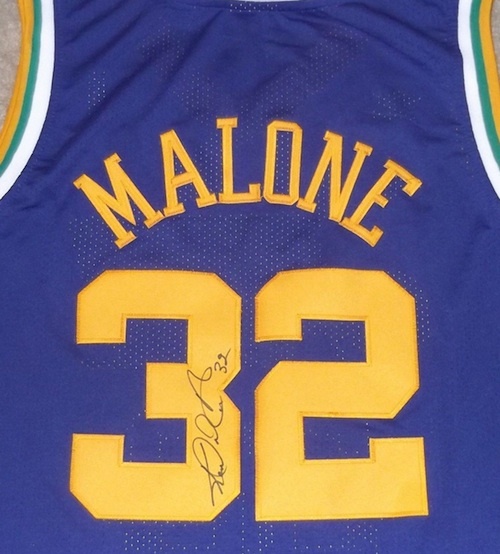 Below you will find an example of what Karl Malone's authentic signature looks like. This can be used as a first point of reference for determining the legitimacy of autograph memorabilia, but is not a substitute for having your items authenticated by a well-respected professional autograph authentication company. Reputable authentication companies include JSA, PSA, Panini Authentic and Mounted Memories, to name a few. 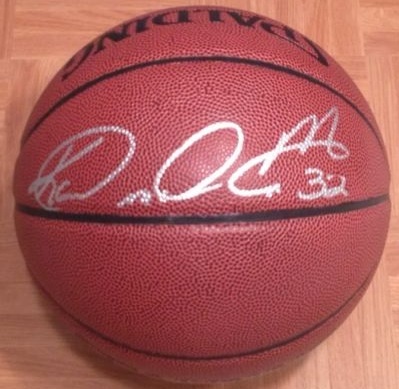 The signature for Karl Malone is somewhat hard to decipher, but he is fairly consistent. A large cursive "K" starts things off, and is followed by an "a-r-l" that ends in a large swoop. Another letter combination occupies the middle and resembles the "a-r-l" from the first name. His middle name is Anthony and he sometimes signs "K-A-M", so it looks like his middle initial. The final name consists only of a large cursive "M" which loops and comes back to underline the letter and leads into a squiggle before his number - 32.